All Durabuilt windows come with dual pane insulating glass as a standard (two individual pieces of glass separated by a sealed airspace). 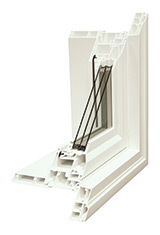 Installing new dual pane windows with our high-performance PVC frames will significantly improve your window & doors performance; especially when old single pane metal systems were previously in place. Triple pane insulating glass (three individual pieces of glass separated by two sealed airspaces) provides added performance benefits, especially in extreme climates, as it features additional glass and airspace for improved insulation. 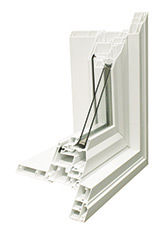 All of our Casement Collection windows support triple pane glass as well as selection of our slider series. Simulations performed by Enermodal Engineering Ltd. using window 5.2 and Therm 5.2 as per NFRC100-2001. Outside temperature -17.8°C, inside temperature 21.1°C. Double-glazed Low-E glass with argon fill. Temperature results shown are average temperatures. [Test Reports EIG10009w, Oct. 15, 2010 – doubles and EIG11001w, Dec. 9, 2010 – triples.] Keff is per NFRC 101-2010. Durabuilt’s triple pane windows deliver superior air-tightness and protection, preventing winter heat loss and summer heat gain. The dual seal combination keeps the entire glass surface warmer / cooler, especially on the inside, which helps retain energy. As a result, triple pane windows can insulate up to 60%* better than their dual pane counterparts. 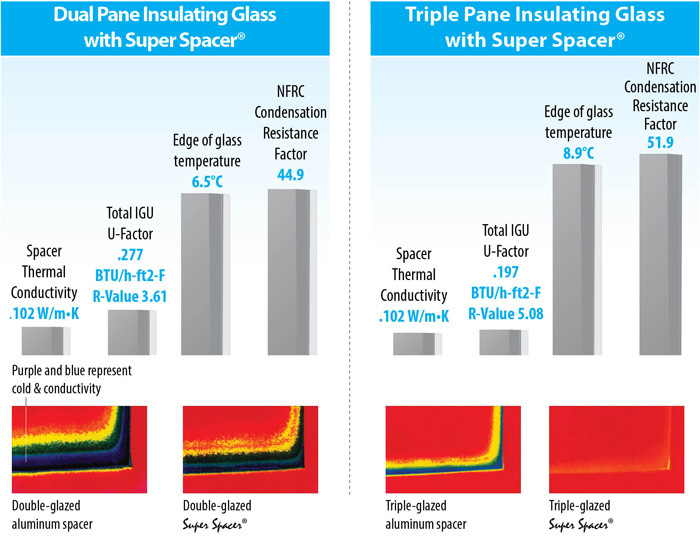 * Study based on a double and triple pane window comparison under controlled circumstances featuring Super Spacer ® and Low E Glass with argon. In today’s housing market, neighbours and distractions are often in close proximity. Triple pane windows are equally as effective at blocking unwanted noise as they are in retaining energy. By trapping sound waves in the first chamber and keeping cool drafts outside, your home will become the tranquil haven you long for. Triple pane insulating glass can improve your relative humidity levels (the point before surface condensation occurs) by almost double due to warmer window surface temperatures. Triple pane is highly recommended if you live in a cold dry climate and desire more moisture and humidity in the home.